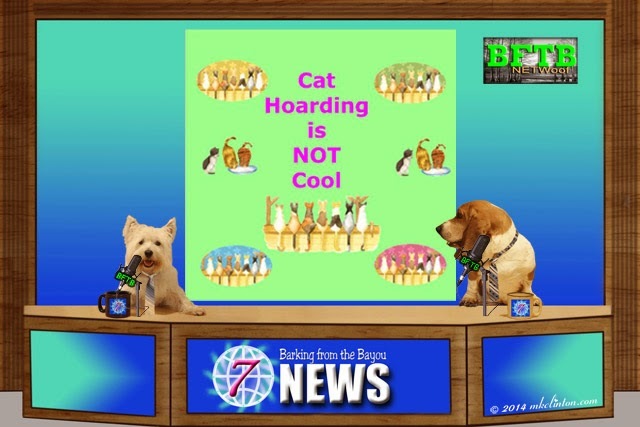 Pierre: “I’d like to think so, for the sake of the cats. All five people living in the house are subject to charges. Let’s move to what is happening in the world of politics. As most everyone knows, Tuesday is Election Day. That means it is time to elect a new mayor for Blogville. We have covered the campaign and it now comes down to casting your vote for either Dory or Murphy & Stanley (co-mayors). It will be a tight race and so every bloggers vote is important. Visit Sarge Speaks to cast your super-secret ballot. BFTB NETWoof News congratulates the candidates for running a nice, friendly race. Humans could learn so much from this campaign. Pierre: “I’ll be bringing out my winter wear if it gets in the 30’s. We need our friends to check their heaters and furnaces before firing those babies up for the first time this year. I hope they stay warm. That's a whole lot of news going on for just one day! Thanks for sharing!! Despite the cost great news about Bentley. Getting cooler here too but we had the hottest Halloween on record. Have a marvellous Monday. That's great news about Bentley! Thanks so much for featuring Cello's dock diving accomplishments! Mom and I both stopped by and liked that FB post for you ;) Senior dogs are wonderful, as I live with one, but they are not a good fit for our family because we are far to active. 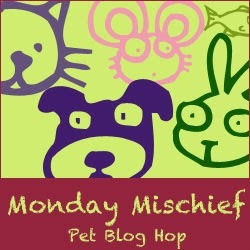 As we age, Mom changes things up for us, but she enjoys high energy dogs, so the older quiet mellow dogs are tough. We wouldn't trade Katie for a million bucks and we will all be seniors one day, but we wouldn't adopt one. They are a good fit for most families, though as most aren't as high energy as my Mom is. Loved the news about the other Bentley! Oh wow! I'm glad I can come here for my one stop shop for the news!! This news reporting keeps getting better and better! We love it! OH YES..... Tomorrow we VOTE... it is VERY impawtant that we cast our Votes... Either way it goes... Blogville will be in Excellent Paws. They are CLASSY CANDIDATES fur SURE. What a great report...we always turn to you all for getting the most up to date animal news!!! Great news about Bentley! Also great posting about Cello's dock diving accomplishments, dock diving is such great fun! You knocked it out of the park again fellas! 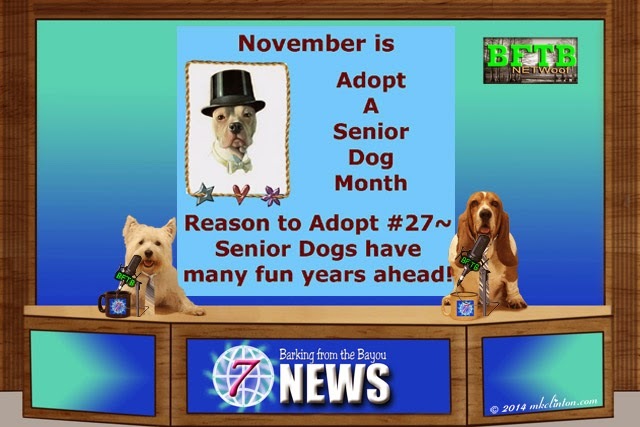 Great reminder about Adopt a Senior Dog month. I think the name "Senior" gives a negative connotation. PAWhaps we should say "seasoned" or "mature" Loved the news. Keep it up! Thank you for these great reports! We love them! Another thing about senior dogs...we can learn and do love to learn...new tricks! Senior dogs ROCK! Plain & Simple. I cannot believe that poor woman's dog racked up tens of thousands of $$ in bills; I'm thinking insurance won't pick up that tab! Like most hoarders, those folks must need emotional help. You cannot keep that many animals & NOT neglect them. Some states have regulations to prevent people from hoarding again, but NY must not be one of them. More than punishment, maybe they need counseling, something's not right w/ those folks. Weird. Thanks for the news updates! Our girls are still so active at 10 years old, it's hard to think of them as seniors! Cricket especially acts just like a puppy sometimes. Age is definitely just a number. I think it's exciting that dogs can often live to 15+ years old now! urgh, I shake my head at cat hoarder stories, why why must they do that. The cats don't deserve that at all.